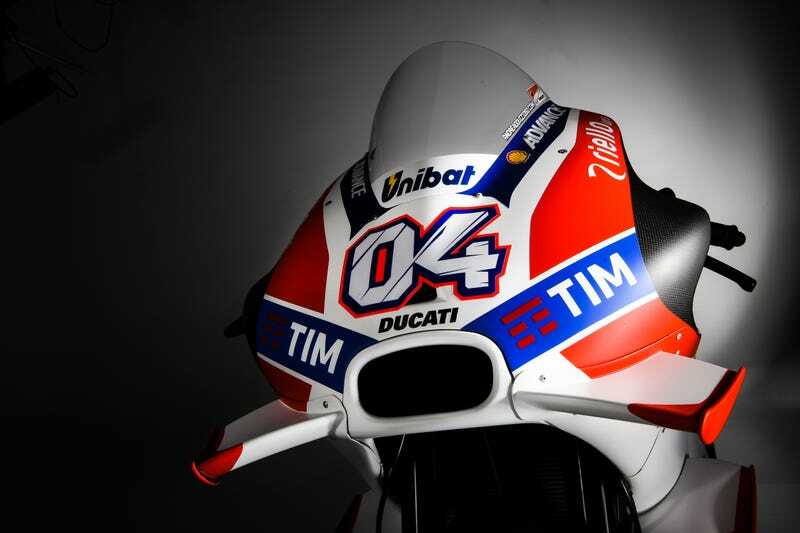 When Ducati first added these little winglets to their MotoGP Desmosedici, there were lots of jokes about “hammerhead sharks” and claims about supposed lift control. But if you listen to riders, it seems they have an entirely different and dastardly purpose—to make it harder for riders who get behind it. Ducati initially said, or implied, that their winglets (they’re actually strakes because they’re deeper than they are wide) were there to help keep the front end of their beastly MotoGP race bike planted on the ground. MotoGP bikes make somewhere in the neighborhood of 240-250 horsepower, and keeping the front end down is always an issue. The problem with this logic is that the math on the created downforce only really works if the bikes are traveling somewhere north of 185 miles per hour. Meanwhile, the bikes’ tendency for wheelies can happen at much lower speeds when riders are getting on the power out of corners. Sure, they have wheelie control technology, but that requires cutting power, and if these actually worked, they could get more drive by keeping both wheels on the ground while staying the gas. The second idea was that they were added to help funnel air into radiator vents to keep the motor from overheating, something Ducati had been struggling with prior. Now, a third use is coming to light, and it’s very Bond-esque. While those little strakes likely don’t keep the front end down, it seems as if they are making it much harder for riders to use the Ducati’s slipstream by creating wake turbulence behind the bikes. Crutchlow has made several comments about whether the winglets are a safety concern, though he also see’s the value they’ve added to the Ducati team. If you watched the race this weekend, you saw how fast Ducati’s GP bikes are in the straights. I love the idea that they’re taking measures to isolate that advantage even more. It definitely raises safety concerns, and if it were to come out that this were true, I don’t know that they should be allowed to keep them. The idea of Ducati engineers coming up with this crazy concept, and the looks on their faces being the same as Bond’s when Q shows him some new gadget, is far too fun not to consider.